CLEARFIELD – A Madera man has been accused in the fatal stabbing of a Blandburg man in March. 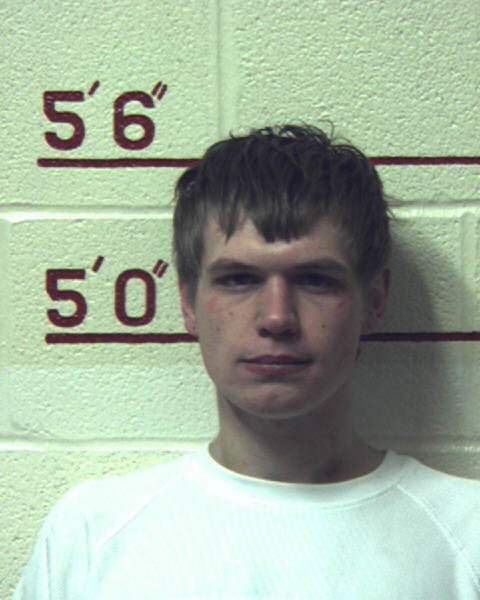 Johnathan Blair Maines, 20, has been charged by Clearfield-based state police with criminal homicide, two felony counts of aggravated assault, two misdemeanor counts of simple assault and a misdemeanor count of recklessly endangering another person. On Wednesday Magisterial District Judge James Glass held all charges to county court following a preliminary hearing. Bail has been denied and Maines remains in county jail. Trooper Scott Sankey testified that he responded to a reported stabbing the afternoon of March 20 at a Main Street apartment in Madera. When he arrived at the scene, it had already been taped off to keep people out. He said investigators learned a male – Joshua A. Sahm – had been stabbed. He had already been transported from the scene by ambulance. Later, it was reported to investigators that Sahm died while en route to the Altoona Hospital. Trooper David Patrick, a criminal investigator, was also assigned to assist with the investigation. He participated in interviews with two witnesses who were present during the stabbing. Prior to the witness interviews, Patrick entered the apartment to observe the crime scene. He saw blood inside the door, on the wall and in the stairway, as well as in an upstairs hallway and bedroom. She went back toward the bedroom and Maines and Sahm were in the hallway. She saw what appeared to be a knife sticking out of Sahm’s back. She said Maines pushed her down the hallway and toward the back steps of the residence. They went to the first floor where they met another male; they went outside to speak briefly. When she went back inside with Maines, she wanted to call for an ambulance and police to help. She located Sahm’s phone lying in blood and used it to call 911. She asked Maines what happened and he allegedly admitted that Sahm had been stabbed twice. A male witness corroborated her story. He told Patrick that he heard scuffling and screaming coming from an upstairs bedroom and then Sahm staggered out; he fell into the wall and was covered in blood. He said when he went outside with Maines and the female witness he questioned them about what happened. The male witness observed a lot of blood on Maines’ jeans. He said that he left the scene while the female witness and Maines went back inside the residence. He wasn’t aware of anyone else being present at the time of the stabbing. Under cross-examination, Patrick said the female witness did say other people were around the residence earlier in the day. She said they had been using methamphetamine the previous night and that morning. Sankey testified that Maines wasn’t at the scene when state police arrived. He said it was learned that he’d fled and been picked up in Madera by a relative. He said Maines wasn’t wearing any shoes and was “cut up.” He reportedly denied to the relative that he had any involvement in the stabbing. According to Sankey, investigators recovered Maines’ sneakers in the upstairs bedroom. He said Maines was later located at residence in the Lecontes Mills area. He said several troopers tried to make contact with someone inside, but no one would come to the door. Maines was eventually taken into custody during the early-morning hours March 21, and he was not wearing the same clothing. In a follow-up interview with the female witness, she provided information that led investigators to where Maines had hidden the clothing he had on during the stabbing. “They were covered in blood,” Sankey testified. On March 22, an autopsy was conducted and showed Sahm had suffered two, fatal stab wounds to his neck and back, according to the affidavit.